It’s hard not to be very impressed with this printer. Really the biggest problem is the manual, which in my version missed key steps and was unclear at some vital points (like the screw on the top of the level sensor). Manuals and setup instructions are so important, especially for beginners to 3D printing which this machine is very well suited to otherwise. For me as an experienced 3D printer user it was relatively easy to understand what needed doing but I can imagine a beginner being totally lost at some points. Having just changed the filament, I have another couple of issues that could be improved upon. Changing the filament is quite tiresome: With no automatic unload or load you’re left either with the entire length of the Bowden tube to purge if you cut the old filament at the extruder gear or either pulling the filament out by hand when releasing the gear which seemed to need far too much effort to be comfortable or using the manual advance/retract which is painfully slow. I’ll need to look for better options here, or Creality need to provide one. I’m also concerned about the feed of the filament into the run-out sensor. With the filament fed from the top of the machine straight down to this sharp narrow hole at the entrance to the sensor, it looks in real danger of snagging. You can just see on this image that there’s a buildup of “scraped” material at the top of the hole and while trying to fit this new filament I actually snapped it at the hole when I accidentally brushed it with my hand. 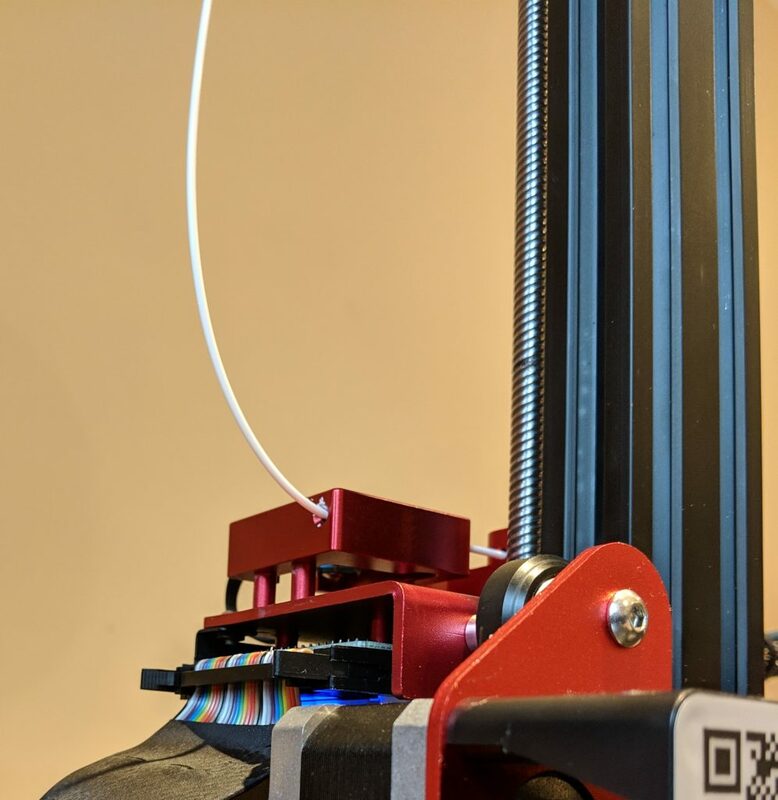 I’m designing a “guide” to fit to the top of the sensor that’ll push the filament away from the hole and allow it to enter more horizontally, and it’ll probably need one at the top as well where it leaves the reel. Overall, it took just 6 hours, from delivery at 11:46am to me releasing the horse from the bed at 17:46pm, and 4 hours of that was just printing. The real problem I have now is my other machines. Before buying the Creality CR10S-Pro I’d been considering the Prusa i3 Mk3. I’ve owned a Mk2 since release, since upgraded to Mk2S, and it’s been a real workhorse, but compared to the CR10S-Pro it looks well, cheap. The CR10 looks solid, and is. The metal parts make the 3D printed parts of the Prusa look like what they are and the silky smooth movement of the bed put the Prusa’s rod & bearings to shame. I’d have recommended the Prusa to anyone 6 months ago but I honestly can’t now. The Prusa is £340 dearer than the CR10S-Pro (OK, that’s the fully build price but the Creality really can’t be called a “kit”), and that’s a huge difference, and it looks like it’s the wrong way around. Put the two machines side by side and you’d say in an instant that the CR10S-Pro was the more expensive and that’s a big problem for Josef Prusa and other manufacturers still selling FDM machines for £1000 or more, let alone those that somehow sell them for 5 figures. As of yet I can’t talk about reliability, but right now, this machine looks like a winner all the way.